This will explain how tent storage in DayZ works and how many inventory slots it has. Ok so rule 1: In a tent every item counts as 1 slot. That means your m4a1 is 1 slot, a tire is 1 slot, a jerrycan is 1 slot, anything and everything is 1 slot when inside a tent. Storage is broken down into 3 different categories, each one has it’s own amount of storage space. 10 tires, 5 jerrycans, 20 bloodbags, 5 Stanag Ammo, 10 Raw Meat. = 50 Slots. So as you can see it doesn’t matter how many slots the item would take in your inventory, it only counts as 1 slot within the tent. If you attempt to place items into a full tent one of two things can happen. The item can drop on the floor near the tent or the item could disappear. 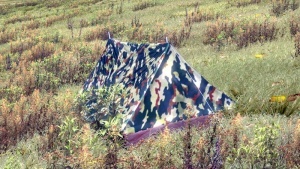 So take care when placing items in the tent. My personal theory on items disappearing after placing in a full tent is — the items are placed under the tent or perhaps under the ground if your tent is on a hill.